Our lead Dermatologist Dr. Sonia Badreshia-Bansal is a Board Certified Dermatologist whom is passionate about patients getting checked for Skin Cancer. This is why we offer FREE pre-cancer screenings and a variety of medical grade sunscreen products in our shop. Skin cancer occurs when skin cells start growing abnormally, causing cancerous growths. Skin Cancer, could you imagine being told you have Skin Cancer? Luckily those set of words isn’t a death sentence. In fact Skin Cancer it is a quite manageable body disorder. Skin Cancer affects more than 2 million Americans a year. People often spend too much time in the sun without sunscreen which results in a dreadful burnt skin. This increases your risk of getting Skin Cancer. New research is suggesting that using a tanning bed too much increases your risk to some forms of Skin Cancer. Skin Cancer is the most common of cancer that Americans are diagnosed with. There are three different types of skin cancer (which are listed below) but with any Skin Cancer, the earlier you get suspecting skin checked out, the quicker a skin cancer treatment can be administered, greatly increasing your chance of survival. Skin Cancer is a very manageable skin disorder with very low risk of death. Just remember that the earlier it gets diagnosed, the higher your chance of survival. Skin cancer may often be preceded by lesions called pre-cancers. The most well-known of these lesions is called actinic keratosis (AKs). An actinic keratosis is considered an early form of squamous cell carcinoma. 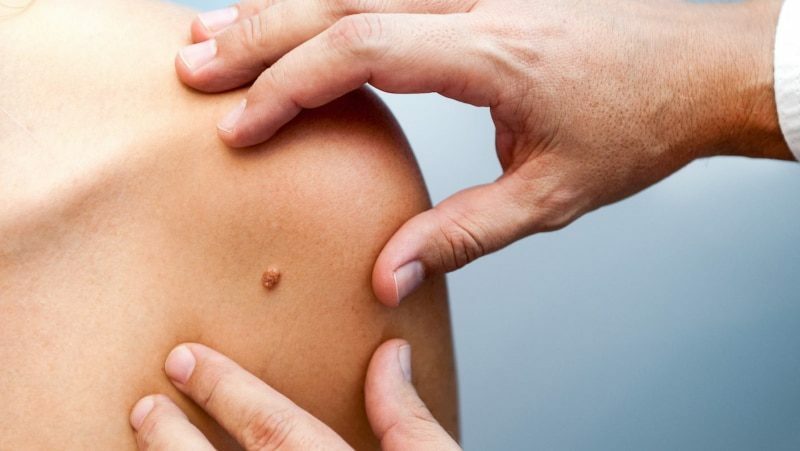 An actinic keratosis, a new or changing mole (nevi), and other unusual lesions on your skin should be carefully monitored and brought to the attention of your doctor. Diagnosing cancer usually requires a skin biopsy. A small piece of skin is removed for examination under a microscope and evaluated with other tests. In general, the treatment plan is based on the risk of the cancer spreading to another location or growing again (recurring) in the same location. Cancers that are likely to spread or recur are treated more aggressively. There are several topical medications that may be prescribed for the treatment of different types of skin cancer, or precancerous lesions, such as AKs. Several dermatological procedures may be performed to remove skin cancers. Cryotherapy – A small amount of liquid nitrogen is used to “freeze” away the lesion. This may be used in combination with other topical medications, such as imiquimod. Curettage-electrodessication – The tumor is scraped off using a sharp-edged device called a curette. The surrounding skin is then cauterized (heated) to prevent bleeding and further remove the tumor. Mohs surgery – A specialized surgery that removes the tumor in stages. Each portion of removed tissue is examined under a microscope to make sure that cancerous cells have been removed while sparing as much normal skin as possible. View the Mohs Surgery Animation to learn more about how this procedure is performed. Radiation and chemotherapy may be recommended in cases when the cancer has spread, or when other medical conditions prevent the use of other treatments. Sunlight is composed of visible light (all the colors we see in daylight), infrared radiation (which provides warmth), and ultraviolet (UV) radiation, which is carcinogenic (cancer-causing). More than 90 percent of all skin cancer is caused by long-term exposure to UV radiation. Melanin in the skin, which gives skin its tan to brown color, can block the damaging effects of UV radiation. The more melanin, the darker the skin. And the darker the skin, the better protected it is from UV radiation. This is why a body darkens when exposed to sunlight (tanning). It is trying to build a better shield. The best protection against skin cancer is to minimize sun exposure, especially between 10 a.m. and 4 p.m. If you do go out in the sun, practice good sun protection habits: use a broad-spectrum sunscreen (SPF 30 or higher that protects against UVA and UVB), making sure to cover the head, lips, hands, neck, and ears. Wear a wide-brimmed hat, sunglasses, and protective clothing. Not only will this dramatically decrease your risk of skin cancer, but it will prevent other sun-damaging conditions, like wrinkles and actinic keratoses. Indoor tanning booths increase the risk of developing skin cancer, despite any claims of their being a safe alternative to natural sunlight. The skin doesn’t tan unless it is first damaged by UV radiation. Intentional tanning should be avoided like any health hazard, such as smoking. While everyone should minimize their exposure to the sun and UV radiation, fair-skinned people, outdoor workers, and residents of sunny climates should use particular caution. Another effective weapon against skin cancer is regular skin self-exams. Use a Body Mole Map to record where spots appear on your skin. You can refer to this record the next time you perform a skin exam to determine if there have been any changes. If you have any risk factors, such as prolonged sun exposure, family history, or a past cancerous lesion, you may benefit from having your skin checked regularly by your doctor. Remember, Dr. Sonia provides free cancer screenings. Please call us for a consultation.